Prerequisites: Very good sailing skills and some athleticism – The Skiff Girls Program is designed for young female sailors up to 19 years old with intermediate skills. It is not necessary to have a sailing partner. Interested in the 29er? Come to Coronado Yacht Club and see what its all about. 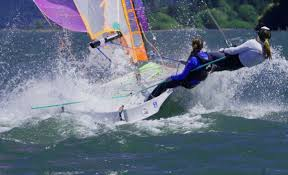 April 17, 2015 in 29er, Catamarans, Seamanship, Youth Sailing.